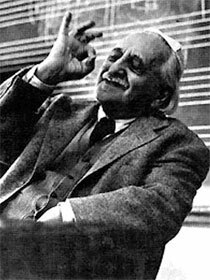 Solomon Rosowsky (1878-1962) was a pioneering composer in the Jewish national school who went on to have a huge influence in Israeli and American Jewish musical life, particularly as a scholar and pedagogue. A fourth-generation Jewish musician, Rosowsky had the distinction of being the son of one of the first graduates of the St. Petersburg Conservatory, Borukh-Leyb Rosowsky (1841-1919). His father went on to become a legendary cantor in Riga, where Rosowsky was born and raised. Despite his father’s career in the synagogue, Rosowsky grew up in a musically cosmopolitan home, where the works of Wagner and Strauss were popular and the Finnish composer Sibelius was a frequent guest. Rosowsky first studied law at the University of Kiev before enrolling in the St. Petersburg Conservatory as a composition major and student of Rimsky-Korsakov, Liadov, and Glazunov. He later also studied conducting under Arthur Nikisch at the Leipzig Conservatory. In 1909 he joined musician Mikhail Gnesin and a handful of other students and conservatory alumni to co-found the Society for Jewish Folk Music. Rosowsky went on to play a prominent role in the group as a composer, critic, and folklorist. His composition, “Fantastisher Tants” (Fantastic Dance), was based on a melody belonging to the ultra-pious and mystical Lubavitch Hasidic sect of Judaism. The work drew immediate acclaim from fellow composers and audiences for its original naturalistic harmonic treatment of folkloric motives and intense rhythmic energy. The piece was published by the Society for Jewish Folk Music in 1914. Between 1917 and 1919, Rosowsky served as music director of a Jewish national art theater headed by director Alexander Granovsky in Petrograd (as St. Petersburg was renamed during World War I). Then in 1920 he returned to Riga, now part of the independent republic of Latvia, where he worked in a local theater, as a music critic, and created a short-lived Jewish National Conservatory of Music. In 1925 he moved to Palestine, where he spent the next two decades composing and researching the history of the liturgical melodies used for traditional Jewish chanting of the Hebrew Bible. The eventual result of his research was the publication of the major musicological study, The Cantillation of the Bible: the Five Books of Moses (New York, 1957). In 1947 he moved to New York, where he taught at the New School for Social Research and the Jewish Theological Seminary.